Quality system to us start from a selected and approved list of primary Supplier, we only make use of an high quality level of raw materials. “One Way” production line and a batch to batch production, allow us a detailed and documented process record traciability. All along the production chain and for each stage an intensive in procees control quality system is ensured. All produced components, for single batch are at the end of the line meticulously checked by our CQ before to be released for spedition. 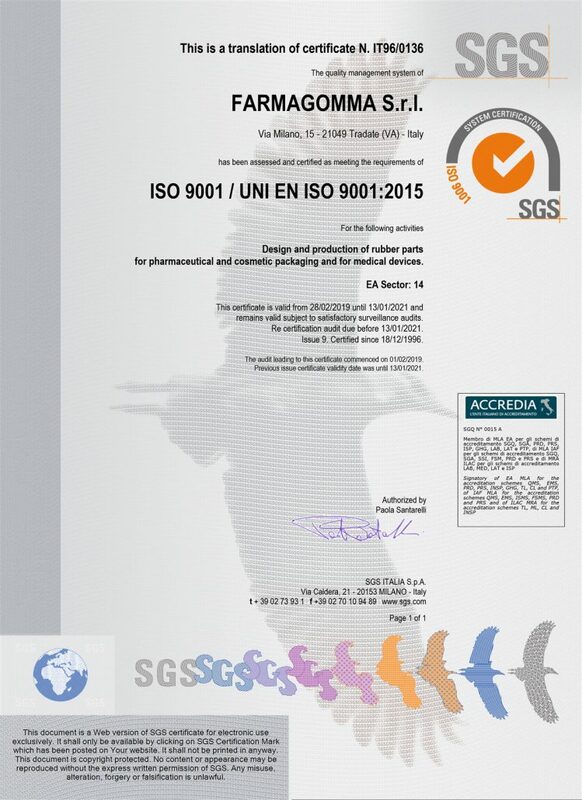 Our quality certification with test results are regularly attached to the delivery. Batch record documents,for each individual lot are available for years for our traciability together a significant retaining samples.A dedicated implementing MES, will automate a consolitated quality system. Where production take place, we assure our attention at hygiene-related aspects, while packaging of finished goods is under controlled quality conditions area ISO 8. Our Emploees play a key rule in our organization and Farmagomma is orientates itself with regards to their professional growth, letting them to work in a healthy and safe enviroment.